Prediction: By 2020, the people left behind (many by their own choice) by accelerating information and communications technologies will form a new cultural group of technology refuseniks who self-segregate from ‘modern’ society. Some will live mostly ‘off the grid’ simply to seek peace and a cure for information overload, while others will commit acts of terror or violence in protest against technology. Resistance to the effects of technological change may inspire some acts of violence, but most violent struggle will still emerge from conflicts tied to religious ideologies, politics and economics. Many people will remain “unconnected” due to their economic circumstances. Some will choose to be unconnected for various reasons – all the time or sometimes. The most infamous neo-Luddite (and some who believe in the strictest definition of “Luddite” would say the only one) is Theodore Kaczynski, also known as the Unabomber and author of a famous Manifesto,50 who took violent action to draw the world’s attention to his concerns, killing three and injuring 27 by sending 15 parcel bombs. “Of course there will be more Unabombers!” wrote Cory Doctorow of Boing Boing to this prediction. Most respondents agreed with some aspects of this 2020 scenario, but there was a great deal of variability in the reasons for these responses. The elaborations provide many interesting insights. A notable number of respondents argued that religious ideologies have been an underlying cause of violent acts throughout human history, and that this prediction’s focus – the impact of advancing technologies – has rarely motivated destruction or death. Naturally, people will protest – but to what extent? Violence is likely, some say, but it will be limited. 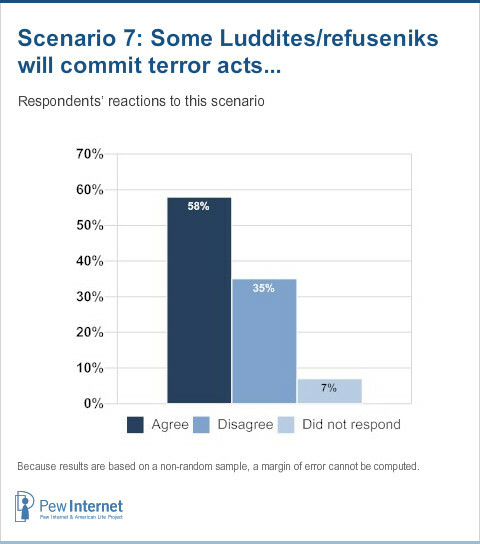 A number of respondents said they expect outbursts of violence motivated by human reactions to and expectations of technological advancements. “We’ll always have a few like Jim Jones and David Koresh, and a few misguided folks will follow,” wrote Joe Bishop, a vice president at Marratech AB. A number of respondents say protests will be tied to technological advances. There were respondents who expressed concern over the potential for damaging acts tied to effects of advancing technologies. “The real danger, in my opinion, is the Bill Joy scenario: techno-terrorists,” wrote Hal Varian of the UC-Berkeley and Google. Some respondents point out that acts of civil disobedience have value. A number of respondents cast this as a battle between ‘old’ and ‘new’ values. Whether technological process moves quickly or slowly, some believe anti-technology violence won’t add up to an enormous problem. It’s expected that people will resist too much connection in various ways. ‘Transparent, humane’ technology is most likely to be accepted. Some respondents said innovations in interface design will make technology more approachable and accessible for the mass population, thus making it less likely to inspire protests of any sort.